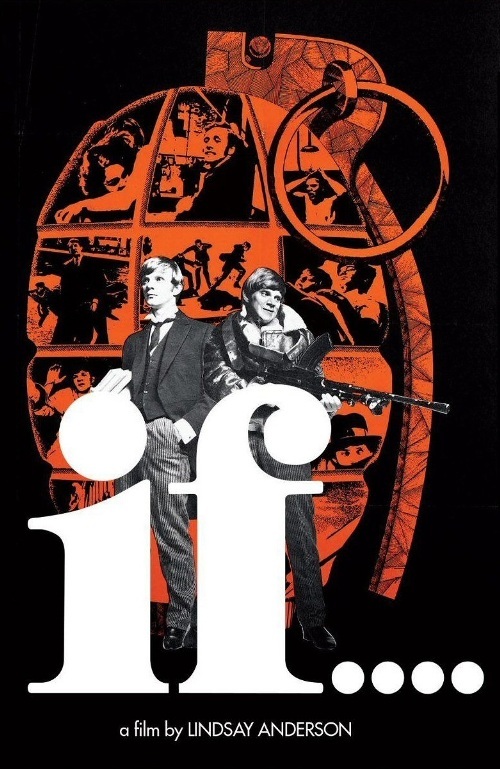 Sad news yesterday of the death at 75 of screenwriter David Sherwin – do read his Guardian obituary and this lovely piece by Malcolm McDowell, who played Mick Travis in his trilogy of films – prompted me to revisit a film that on reflection is probably my favourite of all time: Lindsay Anderson’s If…., which celebrates its 50th birthday this year. A teenager who habitually read film guides, I knew of the reputation of If…. long before I saw it. I’ve written before here of the impact the death of my uncle William had on me when I was 14, and of the legacy that he left me, partly through the things he had owned that I inherited. From his collection of videos, I took a couple that contained films he’d recorded off the television: one was Death in Venice, and the other was If…. He’d recorded If…., I discovered on doing an audit of all my videos a month ago prior to chucking them out, on the occasion of Lindsay Anderson’s death in 1994, when it was broadcast on Channel 4 with a specially recorded introduction by Stephen Frears, who had worked on it as a young assistant director. I don’t think I watched it until I was 16 or 17, and then probably only when it was shown late one Friday night on BBC2, in the days when BBC2 did that sort of thing. It must have been a mindblowing film to watch at that age. When the BFI rereleased it in cinemas in 2002 and there were two screenings in Cambridge, I went to both. By that time it had become an obsession. Last September I happened to meet Philip Bagenal, who played scientifically-minded Peanuts in the film shortly before going up to Cambridge. I was too starstruck to tell him how moved I was to be in his presence. If…. originated as a script, Crusaders, written by Sherwin and John Howlett while the two were teenagers at Tonbridge School. Anderson eventually filmed it mainly at his own Cheltenham College. The film amounts to a study of power relationships within one house, College House, at an independent school, and of the repressive regime of the Whips (four prefects, Rowntree, Denson, Fortinbras and Barnes). Rebelling against their brutality are five Crusaders, senior boys Mick Travis, Johnny Knightly and Wallace, junior boy Bobby Phillips, and a girl (called simply The Girl in the credits) whom Travis and Knightly meet in a roadside café while playing truant. The opening of the film, which sets the familiar black and white Paramount logo against the school song, ‘Stand up, stand up for College’, sung to the familiar tune Ellacombe, is excitingly uneasy, and I think I have always found it so. Still uneasier, suddenly the titles are in colour. A great deal has been written about Anderson’s juxtaposition of black & white and colour film, much of it nonsense. I think it’s generally accepted now that logistical problems led to the filming of the interior of the chapel being done with black & white film. I’m sure Anderson, mischievous to the last, would have enjoyed critics looking for meaning in the contrasts between the colour and monochrome sequences, which might or might not really be there. Still, the contrasts can be striking. Take for instance the Whips’ study, filmed in colour, a place of privilege and sober discussion, set against the happy austerity of the juniors’ black & white kitchen, where the scum are having a great time eating beans on toast. Or the fencing scene, where the Crusaders’ black & white game of war with their mock Shakespearean dialogue turns, West Side Story-like, into real war when they burst balletically through a door and Wallace draws Mick Travis’s blood, however accidentally. Travis is thrilled. I got sidetracked. Let’s talk about Jute and about power. Our way into the film is through Jute (Sean Bury). Like us, he’s a new boy in the school. In the opening scene he is overawed, gazing uncomprehendingly at the noticeboard, not knowing the rules. 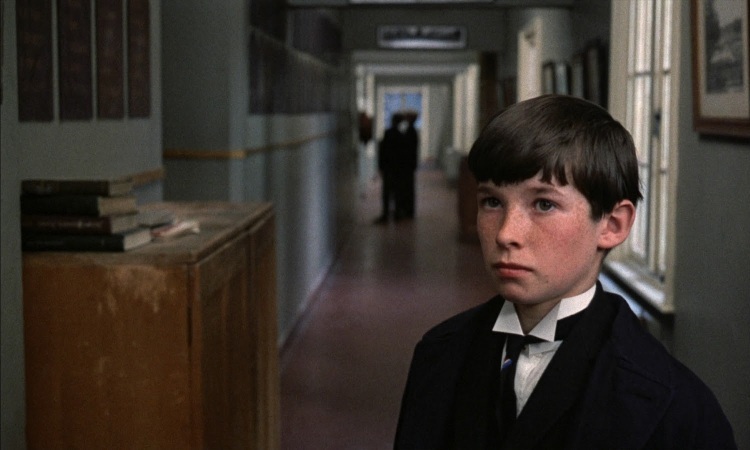 Even the perpetually bullied junior boy Biles sneers at him, ‘You’re blocking my view, scum.’ Jute’s never the main player in the film, he’s an everyman (or everyboy), and through the film we follow his assimilation into the school. At the start he’s unsure. He calls Rowntree ‘sir’ even though he’s not a teacher; in chapel Brunning has to help him find the right hymn; he struggles to remember the right words when Brunning and Markland test him on school vocab; in gym he quakes before the vaulting horse like a fawn. But increasingly he takes part, he’s a joiner in. He plays rugby, sings in the chapel choir, he takes on ceremonial roles like bringing the chalice the house has just won to the top table. By the end he’s serving in chapel. Jute is the boy schools like this are supposed to turn out. Starting at the same time as Jute is straggly-moustached John Thomas (Ben Aris), one of those teachers who is both disappointed and disappointing. He is shown up to his room by the housemaster’s wife in the film’s first black & white sequence. Both he and Mrs Kemp are shy and nervous, and after she leaves he sits on his bed in this drab little room, the eaves imposing, and seems to be the embodiment of human loneliness. He too assimilates in a way, and in rugby practice appears to be popular with the boys, but later scenes tell a different story. Whip Denson, doing his nightly rounds, finds Thomas working on his car and advises him not to be too long. ‘Sorry, Denson,’ he replies. 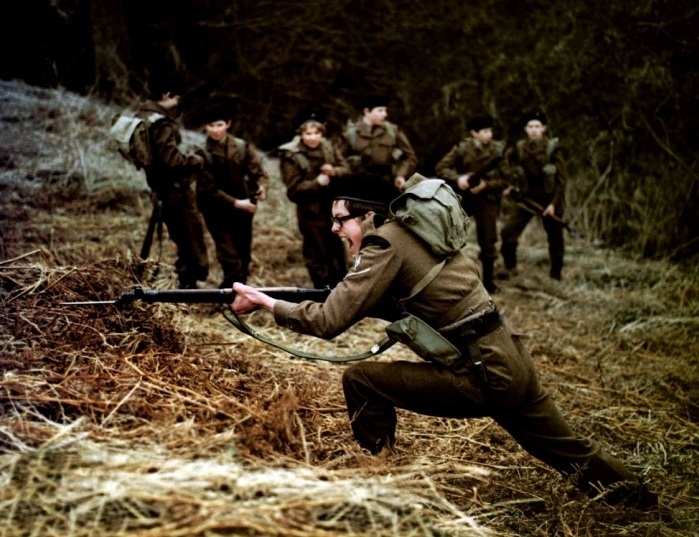 When, out on manoeuvres with the cadet corps, he dives for cover and is liberally drizzled with hot tea from a leaking urn, it becomes clear he is a man without authority. Simply by looking unlucky, he becomes unlucky. It’s not a matter of everyone knowing their place in established power structures, it’s also about people (Denson among them) who don’t toe the line. Just as John Thomas cowers before Denson, so too does housemaster Mr Kemp (Arthur Lowe) before all the Whips. Here is a man who by temperament should have been a bank manager, not put in charge of children. Warned of insurrection by Rowntree he simply devolves his power to the Whip, saying pathetically, ‘You must do what you think best,’ and popping another orange segment into his mouth. The Headmaster (a magnificent Peter Jeffrey) paints himself as a progressive, making platitudinous speeches to the prefects, but turns out to be just another fool. By their failure to fulfil their designated roles they are complicit in the Whips’ reign of terror. Terrifying it is, too. Barnes and Denson stalk the corridors and yell ‘DORMITORY INSPECTION IN THREE MINUTES’ with military synchronicity. You can see why they don’t like Travis, a boy (man, really; he returns to school with a resplendent moustache that only Knightly is allowed to see before he shaves it off) who is determined to stick out, apparently for the pleasure of sticking out. Though Knightly and Wallace are committed to the cause, Travis is invariably the one who goes a step too far. A marvellous scene in the Crusaders’ study with the three boys talking at cross purposes illustrates perfectly the temperamental differences between them. Travis poseurishly expounds his theories of war (‘Violence and revolution are the only pure acts’), while Knightly, the joker, reads the horoscope aloud for the others’ amusement, and dreamy Wallace talks of his concerns that he’s going bald. What I’ve written so far may give the impression that If…. is a cold and earnest film. In fact it’s so far from that. It depicts the whole experience of being young, including the romance of youth. Take Wallace’s love affair with Bobby Phillips, a junior boy a few years younger than him though more mature in outlook, a relationship depicted with such economy and tenderness. They don’t share more than a handful of scenes together, but it’s one of my favourite romantic relationships in film. If you’ve seen it, you’ll remember that scene. Phillips, about to put his sweater on, looks down and sees Wallace preparing to leap up to the high bar. They exchange glances as Biles and Machin look on. Wallace’s gymnastics are hypnotic, set to Marc Wilkinson’s shimmering music (itself partly inspired by the Missa Luba that Travis likes to put on his record player, and sometimes underscoring it in the film). It feels like one of the mesmerising scenes with backwards music from the end of Jean Vigo’s Zéro de conduite, the film supposed to have inspired this one. Who wouldn’t fall for Wallace under these circumstances? Bobby puts his sweater on but continues to gaze, distractedly. The moment of falling in love has never been better depicted on screen. Some boys are misfits. Peanuts, for instance, whom Travis approaches one night, apparently to invite him to become a Crusader. Peanuts looks at the stars through his telescope and talks of space. His concerns seem to be higher, and he hands back the bullet Travis offers him. He’s a pacifist, we might think; only out on manoeuvres he embraces warfare absolutely, condemning his charges for failing to do the Yell of Hate, so it can’t be that. Meanwhile, Mick accepts the thing Peanuts offers in return, his telescope, but uses it to look not at the stars but at the Girl he and Knightly have enlisted to join the resistance. Stephans is another nearly boy, intent on becoming a Whip, and unpopular with others because of his priggishness. Might he have made a Crusader instead? He’d surely have had more fun that way. Let’s look at Biles, strung up in the toilets by his bullies. Who would think to view him sideways on? The anarchy of the gaze. Then the title appears on screen again, ending the film as it began. Was this just an academic hypothesis, an exercise, as the Brechtian intertitles might lead you to believe? Even if so, it’s an engrossing one. I love it because it seems to contain everything (well, except girls). I loved that, watching it as a boy, there were any number of characters I saw reflections of myself in, so many that I might have been. I think I wanted to be Wallace, probably because I had a thing for Bobby Phillips. In reality I was probably Markland.